When I was coaching a very good group of young athletes in Clydesdale Harriers in the 1970’s, I very quickly became aware of the high quality group forming at Bellahouston Harriers — the names of Peter Fleming, George Braidwood, Graham Getty and Andy Daly became very familiar and were among the first results I looked for on a Saturday afternoon. Much later – well, in the early 1980’s – I was lucky enough to be working with an excellent group of senior 1500/5000/10000 metres runners at Coatbridge on Wednesdays. Alex Gilmour approached me when I arrived one evening and said he had brought a new guy along, did I mind? The track that night was kind of slippery so we went out on to the roads where there was a triangle which was just over a mile in distance. The notion was to do five reps in a set time. At the end of the first lap the group, usually well disciplined, arrived in a long straggle with Alex and Eddie Stewart right out in front and the new boy not far behind. So I took Alex and Eddie to one side and asked them what they thought they were playing at. It seems the new boy had forced the pace so much that it became a race! So we finished the five reps after I had suggested to him that he sit in the pack for the remainder. The new boy was Graham Getty acting like a Harrier – they are a competitive breed, Harriers, and on any first encounter they try to test the mettle of their future training companions. However, after that night he settled in remarkably well, became a popular member of the group and did his share of the work. When we made contact recently I asked him to complete a wee questionnaire for the website and he did so quite quickly and the results are below. How Did You Get Involved in the Sport Initially? Through my school (Hutchesons’ Grammar School). During the winter, PE Classes were replaced by cross country runs around the rugby fields, culminating in the school championships at the end of the season.. I ran my first cross country run in 1971 at the age of eleven and won the Primary 7 Championship – relatively easy and much to my surprise. From then on, I realised that Cross-Country was maybe something I could be good at! As a result of my performances at school, I was encouraged to join the local running club – Bellahouston Harriers – which, at that time, was continually in the news through the performances of Frank Clement leading up to him representing Britain in the 1500 metres in the 1976 Olympic Games. More success came at school, winning in 1973 the Year 2 and in 1976 the Year 5 championships, meaning that by the time I reached University in 1977 I was hooked as a runner! Has Any Individual or Group had a Marked Effect on Either Your Attitude to the Sport or to Your Performance? Yes! Three Individuals plus one group. At school my PE teacher Alec Percy who told me to concentrate on my cross country running rather than rugby. At the time I was very upset at his comments regarding my rugby playing skills…. Andy Daly, a great team mate of mine at Bellahouston Harriers. Andy and I started running at the same time. We spent hours and hours training together, including while on holidays in Spain and Greece. Nothing would come in the way of our training sessions. Andy had a tremendous work ethic and I knew if I was to make the team at Bellahouston then I had to try to keep up with him. While we were great mates, if there was one person I wanted to beat, it was Andy! Unfortunately I rarely succeeded. Group: My team mates at Bellahouston Harriers from about 1975 to 1985. A group of us just seemed to join the club at the same time and all of us straight from school: George Braidwood/Peter Fleming/Andy Daly/Tony Coyne/myself. Training and competing with guys of this ability drew the best out of me; I knew that if I didn’t run well in any one race, I wouldn’t be in the team for the next week. Having such a strong squad of young athletes led to a successful Bellahouston Harriers. Success bred success and then the group attracted more athletes including Alistair McAngus, Hammy Cox and Neil Black, making it even harder for me to ‘make the team’! All I could do was train even harder. You could be more successful than those who had more natural talent than you but who did not apply themselves as well. You can’t take short cuts! There is no easy way to success! You are only as good as your last race. The sport also enabled me to travel and hence to get to know many people up and down the country. Can You Describe Your General Attitude to the Sport? Work Hard and Persevere! What Do You Consider Your Best Ever Performance? Probably the London Marathon in 1984 when I went under 2:20 for the first time (2:19:34) and when probably for the first and last time in my career I beat my team mate Peter Fleming! I went through half way in about 69 minutes and finished feeling I had a bit too much left in the tank. I also have fond memories of my first marathon in 1980, one month after my twentieth birthday. This was the British Students Championship which was incorporated into the Sandbach marathon. I finished in 2:25, second in the Students’ Championships and eleventh overall. I won the prize for the first novice. I also remember subsequently getting a letter from the SAAA who reprimanded me for competing while under-age: the marathon limit in Scotland at that time was twenty one! As a student in my third(and possibly final) year at University, I couldn’t understand how I could possibly go through my university career without being able to run in the Student Marathon Championships because I was too young! For information, the winner of the Student Championships was Evan Cameron who went on to win the Scottish Championships in 1985 when I was third. And the Worst? My second marathon! After the success of my first marathon in 1980, I thought that I should start my second one a bit more aggressively and that by doing so I could win the British Students Championships. So I started far more quickly going through ten miles in under 52 minutes but not taking account of the very hot weather. I finished the race outside the medals in 2:31 and had to go immediately to hospital for treatment on my foot and suffering from sunburn on my shoulders. During the race I had noticed that my shoe had changed colour, I thought I had stood on something – little did I realise that this was due to blood. I had a huge piece of the sole of my foot hanging off – literally by a thread! That race told me – you have to respect the marathon distance! While 2:31 was still a pretty decent time, I also learnt that day the value of pace judgement. Graham Getty 11th; George Braidwood 8th; Hammy Cox 2nd; Andy Daly 2nd; Neil Black 1st; Peter Fleming 1st; Tony Coyne 3rd and the erratic Alistair McAngus 4th. In his excellent history of the race, Colin Shields says: Allister Hutton again turned in his usual good performance on Stage Two gaining eight places with the fastest time to establish a narrow 3 second lead over Clyde Valley. A record run by Ian Elliott, bettering his own stage record by no less than 47 seconds, gave Southern a 77 second lead over Bellahouston for whom Andy Daly then caught up 46 seconds. Neil Black then recorded the fastest lap to give Bellahouston a 31 second lead which was extended on Stage Six by Peter Fleming to 47 seconds. The positions were drastically revised on Stage Seven, Craig Hunter ran a storming lap for Southern to hand over a 43 second lead over Edinburgh AC with Bellahouston another 13 seconds behind in third place. The two Edinburgh clubs retained their positions on the final stage with marathon star Graham Laing gaining another set of medals for Aberdeen when making up almost three minutes on Bellahouston over the final stage.”. It was an excellent team run which, with more luck on the last stage, would have come away with medals. However the complete team was out in the relay again the following year and finished second, The team was – in running order – Tony Coyne 8th, Neil Black 1st; Hammy Cox 1st; Andy Daly 2nd; Graham Getty (with third fastest time on his stage) 2nd; George Braidwood 2nd; Alistair McAngus, with a much better run, 3rd; Peter Fleming 2nd. Black, Cox and Fleming all had the fastest times on their stages. Colin Shields wrote about it as follows in his book “Whatever the Weather”: “After a solid start Aberdeen were behind Southern and Bellahouston on stages one and two when Craig Ross, taking 30 seconds off the Stage Four record took them into a lead they were never again to lose. This was Aberdeen’s only fastest stage time of the day but in good running conditions, Hammy Cox (Stage Three), Allister Hutton (Stage Six) and Peter Fleming (Stage Eight) all broke or equalled stage records. Between stages 5 and 7 Peter Wilson, Fraser Clyne and Mike Murray added another 7 seconds to Aberdeen’s lead such that Colin Youngson, running in the race for the eighteenth time, took off with a lead of 34 seconds from Southern and 53 from Bellahouston. In spite of a determined chase by Fleming who closed to within 20 seconds at one point, Youngson held on to bring Aberdeen to victory. They recorded 3:35:30 – the second fastest time in the race rankings and over 20 minutes faster than Aberdeen would record in their next victory in three years time. In 1984 a changed team finished fourth with the high being Peter Fleming’s fastest time on the last leg and the low being a disappointing run from Alistair McAngus on the sixth stage. The team this time was Tony Coyne 15th; George Braidwood 5th; Hammy Cox 2nd; Graham Getty 2nd; Andy Daly 1st; Alistair McAngus 7th; Robert Fitzsimons 6th; Peter Fleming 4th. These had been the really good years and the club slumped gradually from this high point. Over the next few years the top men moved away from the club. For business reasons Graham moved to London, Peter Fleming switched to Reebok Racing Club in Edinburgh, George Braidwood went on to Springburn when he moved to live in Bishopbriggs, Tony Coyne went to Shettleston Harriers and Robert Fitzsimons and Alistair McAngus went to Kilbarchan AAC, Neil Black left the country and Hammy Cox went back to Greenock. A good measure of an athlete’s calibre is often their record in championships and other major races. Their readiness to take part in team events is also worth looking at. Many ‘big names’ are at times reluctant to compete in team events and there are examples of this all the way through athletics literature. With that in mind, we can look at the attitudes and performances of Graham and his contemporaries through the late 70’s and 80’s. Graham’s first National Cross Country Championship as a Youth (Under 17) was in February, 1977 at Glenrothes on a very snowy day and on what would normally have been a good running trail. But it was cold, short spikes were not much use, trainers were worse and lots of the young – and some of the not so young – dropped out or were seen in tears at the finish. Welcome to the world of cross-country, boys, where the race always went ahead. The Bellahouston Harriers team was made up of Paul Brown (8th), Peter Fleming (13th), Andy Daly (15th), Graham Getty (19th) and George Braidwood (45th). The team was second to Edinburgh AC with Graham Williamson winning. It is interesting to note that the Fleming/Daly/Getty/Braidwood group was already in place and that they all went on to become significantly good seniors. A year later in March 1978 on their home turf, they could have been expected to pick up medals of some sort but the team just missed out with fourth place. The team consisted of Duncan McTavish (9th), Andy Daly (14th), Graham Getty (19th) and Paul Brown (22nd). The step up to Under 20 level is a big one – there is often a tendency for Under 17 races to start with a rush, have a sleep in the middle and finish fast: the Springburn teams coached by Eddie Sinclair won so much because they forgot to have the sleep in the middle and ran fairly hard all the way. The Bellahouston chaps were the same but nevertheless if the opposition have a wee sleep there is always the temptation to ease off just a bit. Among the Seniors that is never the case – especially if the runner beside them is a first year U20! Several of the Bellahouston Juniors ran that year in the team for the Edinburgh to Glasgow but Graham was not among them although Andy and Peter Brown ran well enough in the team which finished ninth. In the National that year (1979), Graham had run for the Strathclyde University team that won the race when he finished in twelfth – Brian McSloy won the race, Colin Farquharson was nineteenth and Ian Smith was twenty second. In 1980, the National was run at Irvine and Graham was fourth of the Bellahouston team that was third: he finished twenty fourth with Braidwood (3rd), McTavish (20th) and Daly (21st) in front of him. Graham really knew he was a Senior when he ran the first of his Edinburgh to Glasgow relays in November. The team was ninth and all the young lions were there. Olympian Frank Clement ran the first stage (2nd), George Braidwood had a very good second leg to drop only one place to Ian Elliott of Edinburgh Southern Harriers, Andy Daly held third on the third stage before Peter Fleming dropped to sixth place on the fourth stage. Graham was running on the open-to-the-elements fifth stage and picked up one place to hand over in fifth to Campbell Joss for the longest and very star-studded sixth leg. He dropped to eighth and them Malky Steel dropped one place to be ninth when he handed over to Arthur McMaster who kept the place to the finish. In summer 1980 Graham ran his first marathon. It was at Sandbach in June where he was eleventh and second Scot (Evan Cameron was ninth less than a minute ahead ) in 2:25:46. It was a very creditable outing indeed. Came the Nationals in February 1981 and the Bellahouston team was third again. With four to count the Bellahouston team was Andy Daly (8th), Peter Fleming (15th) , Graham in twenty fourth position and John Hendry. That summer he was back on the marathon trail again and again it was at Sandbach. It was a bit disappointing after the previous year – this time he was forty fourth in 2:31:10. The National in February 1982 was back at Irvine and by now Graham and his team-mates were first year Seniors. There were 382 runners in the race and the team finished fifth with the runners being G Braidwood (10th), N Black (12th), Graham (35th), H Cox (37th) and A Daly (39th). That summer he stepped up the number of marathons tackled and started with the SAAA championships at Grangemouth in July. He was seventh in 2:33:37. The next one was the Glasgow Marathon in October when he ran a personal best time of 2:25:38. Not only was it a personal best but he lifted some notable scalps – eg Jim Alder was two places behind and others following him over the line were Willie Sheridan, David Wyper and Alan Partridge. It was a good end to the season. In the National at the end of the 1983 season the club was seventh of the thirty one clubs with 440 men completing the course. Bellahouston runners were G Braidwood (2nd), A Daly (18th), G Getty (24th), F Clement (42nd), C Joss (85th) and T Coyne (96th). It is interesting to see Frank Clement – whose career at the top had finished in about 1980 turning out for the team and doing so well. In 1984 at Irvine, the team was fifth with the counting runners being G Braidwood eleventh, Peter Fleming twenty fourth, Graham Getty fortieth, Andy Daly forty fourth, and Alistair McAngus fifty eighth. There was only one marathon that summer and it was again the Glasgow race and again there was a personal best attached. He finished fifteenth in 2:24:24. In 1984 there were two marathons again. The first was the London Marathon in May when fifty fourth in 2:19:34. His first time under 2:20 and to make it a wee bit sweeter, he was forty eight places ahead of team mate Peter Fleming! He came back for the Glasgow Marathon in September when he was fourteenth in 2:19:24 (another personal best) ahead of many very good men once more. In 1985, the team was tenth with the four top men being George Braidwood fourth, Tony Coyne forty ninth, Graham sixtieth and Tom Donnelly one hundred and twenty first. There were two in 1985 as well: the first was the SAAA Marathon Championships in Edinburgh in June when he was third to win his first Scottish individual medal. Evan Cameron won in 2:22:49, Colin Youngson was second in 2:23:46 and Graham was third in 2:24:13 – less than half a minute away from second! He then went for the Glasgow marathon as a member of the Scottish team in September where he finished twenty fourth in 2:23:25. 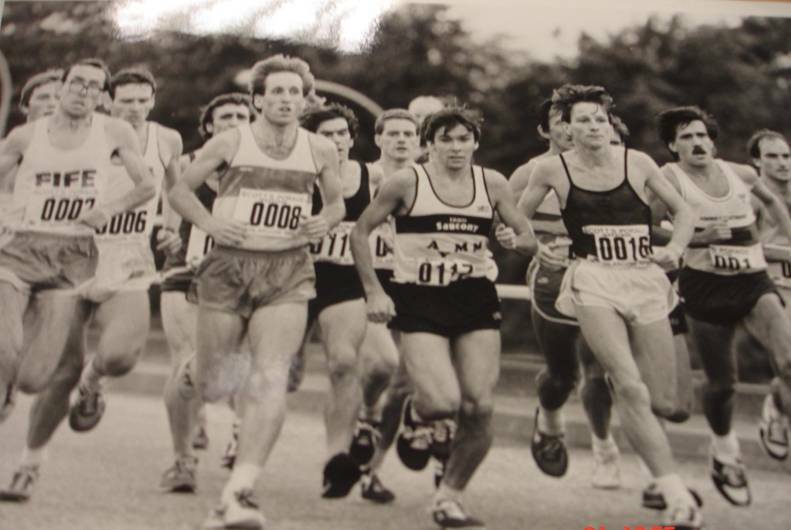 In 1986 the team was again out of the medals with Graham finishing fifty seventh out of the 585 finishers. The main Bellahouston finishers were George Braidwood nineteenth, Peter Fleming twenty seventh, Graham Getty fifty seventh and Tony Coyne seventy sixth. That was Graham’s last National in Bellahouston colours – his next run was in 1989 and he turned out in Cambuslang Harriers colours. However he did run another marathon that year – London in April. This time he finished eighty fifth in 2:23:42. This was to be his last marathon. He had run ten with only two outside 2:30 but more than compensated for by two inside 2:20 plus a SAAA medal for the event! A first class record. In 1986 Graham went to live and work in London. Never the most elegant of runners, the moment the English runners saw him in action they wanted him for their own club teams. So they all made offers to try to entice him to join their club but he decided to join Shaftesbury Barnet Harriers and it turned out to be a good move. They had several very good runners in their teams, they had lots of runners in their teams and they received invitations to and took part in all the big races on the calendar. Graham proved a valuable addition to the club and raced more often than most of the big names. He also won their club championship. However, his first race – in 1986 – as in the Southern 12 Stage Relay where the team was first gave him a wee hint of what was to come. The main races on the calendar were the Southern Championships, the Southern 12 Stage and the National 12 Stage Relays. He also came back to Scotland from time to time to run in the National or the Edinburgh to Glasgow – but for Cambuslang and not for Bellahouston Harriers. In 1987 he took part in many races but in the Southern Championships he was seventy third but the team was second and he took home a silver medal. Later that year the team had been eighth in the Southern and eleventh in the National 12 Stage Relays. Although there were no marathons that year he did record a good 31:16.77 for the 10000 metres on the track. A year later he had brought this down to 30:43.66. 20 years later this time would have led the Scottish rankings. He had started 1988 with a good run in the Southern Championships. where he was thirty second but although he had moved well up the field since the previous year, the club had slipped to fifth in what is a very competitive field. Later in the year the team had moved up to fourth in the Southern 12 Stage but slipped to twenty sixth in the National. It was all down to the availability of runners but Graham appeared regularly, raced as hard as he could and had become a valued team member. In the Southern at the end of the winter – in 1989 – he was thirty eighth but the team had slumped to a lowly twenty seventh. Their form in the long relays that year was no better – they were nineteenth in the Southern and did not run in the National 12 Stage. Graham was running well but they had to get their best runners out. In 1989 he was back in Scotland for the National – this time in the red and white of Cambuslang Harriers The race was at Hawick and he was twenty sixth in the winning Cambuslang team. In November 1989 he again travelled north and ran the first stage of the Edinburgh to Glasgow where he finished sixth in the team that finished second. He was back in Scotland in 1990 for the National Championships in February but although he ran well enough it was not enough to be a scoring runner for the winning Cambuslang team. However he had already gone to the European Clubs Championship in Portugal in February where the team finished tenth with Graham sixty third. Shaftesbury ran much better in the Southern Twelve Stage Relay in March to be third which ensured their place in the National 12 Stage the following month. Graham came back up in November for the Edinburgh to Glasgow where Cambuslang finished sixth and ended his year with a victory in the Strathclyde University Past v Present match at Stepps. We know about the team mates he had at Bellahouston but the list if members of Shaftesbury who were available to the club is equally impressive – Julian Goater (Team gold and silver in World Cross Country Championships in 1979 and 1982 plus individual 10000 bronze in the Commonwealth Games: he also has the distinction of the biggest winning margin in the National Cross-country (1981) of approx 2 minutes, Jim Espir (Sub-four miler, winner of both 1500m and 5000m at the Maccabiah Games in 1981), Dominic Bannister (Commonwealth Games Marathon, 2002, World Cross runner), John Sherban (Scottish and English International track and country), Joe Dunbar (top class track and cross-country runner) and many others. There was also a runner called Mike Williams whom Graham rated very highly: he was certainly well placed in many of the Shaftesbury championship and team races. Had they all been available all the time – as Graham was – the club would have been much more successful. There were no races in Scotland in 1991 other than the Strathclyde University race at the year’s end which he won for the second year in succession. The first championship however was the Southern Counties where he finished twenty eighth: Shaftesbury with Sherban and Bannister running, won the race. Incidentally one of his team mates that day was Kirk Dumpleton (34th) whose main claim to fame is that as a young athlete he defeated both Ovett and Coe in the same race. At the end of February in the English championships he was 133rd in the team that finished an agonising fourth in a race with nine athletes per team to score. In April at the Southern Counties 12 Stage the team was again fourth but with a no-doubt beefed up team they were second in the National 12 Stage. An excellent result in a race of very high calibre on every stage, and for Graham there was the added pleasure of running 14:32 for the fifteenth fastest times on the short stage which is still one of the fastest time run by any Shaftesury Harrier, fifth on their all-time list. 1992 was his last really serious year as an athlete and he had good and bad news in the Southern Counties when he finished a lowly 106th and was a non-scorer in the winning team! In February he ran in the Scottish Championships for the winning Cambuslang team and finished thirty fourth. In the Southern Counties 12 Stage Relay the club won. By April the team was down in fifth in the National 12 Stage and at the end of May he came back to Scotland for the Scottish Ten Mile Road Championship where he was eighth in 53:37. Due to frequent injury and increasing business demands, he competed only ten times between 1993 and 1995 with the only championship being the English National in 1995 when he was well down the field. Graham was a very good athlete who ran in many good teams with many outstanding runners and was always up there with them and I don’t think there was ever a star name in his team that he did not beat at one time or another. As much as a runner he was a competitor.